It hasn't always been easy for Tina Johnston, who decided to have just one more child after her first two were born and ended up with twins. Now they are all of school age life is a bit easier. But keeping all four busy – especially over the summer – requires a lot of imagination and hard work. As Tina's husband Dom is self-employed times are tough, so trying to find something to keep all four children happy that doesn't cost the earth is challenging, to say the least. It's especially difficult as the two eldest are eight and ten, while the twins are only just five. "Often Paul and Jack, my two eldest, have no interest in what Sofia and Amy want to do," says Tina, a full-time mum who used to work as a publicist for a hotel events company. "In my case it's not so much that girls and boys have different interests, it's the discrepancy in age." Last summer, the boys were enrolled in a holiday summer play scheme which was subsidised by the government. "It took place at a local school not far from us and I signed up the boys for three weeks. They absolutely loved it, but the girls were too young as the minimum age was five," says Tina. "Saying that, I was able to spend some quality time with the girls and we did a lot of things together which the boys have more or less outgrown, activities such as swinging in the playground and going to the local farm, which has a big petting zoo. And it was all free!" This year, Tina is enrolling all four children in the summer playscheme. "They are only going for two weeks in total, but it's a lot cheaper than paying for childcare or paying to keep them entertained every day. And they'll enjoy it," she says. "They have two outings a week which the kids can choose from, so the boys will probably visit the Science Museum and waterpark, while the girls will go to the Toy Museum and on a picnic or something. 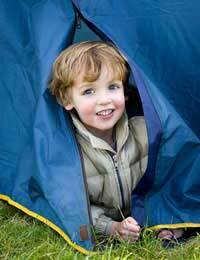 Luckily, all my kids love all activities that involve the great outdoors." When the playscheme ends, Tina expects to make the most of the summer weather. "My kids love being outside, and we live near an enormous park in south London that has loads to do," Tina says. "I usually load up the picnic basket, take a few balls and go out for the day. "Sometimes we vary things by inviting other kids, going to a different park or taking in a free museum first. That way nobody gets too bored – and taking a child with us means that their mum will return the favour, so I even get some free childcare out of it. "During the school holidays we also visit the cinema a lot, as any cinemas have greatly reduced morning showings of children's films. I often sneak in some homemade popcorn or chocolate bars from the corner shop, so we all see a film for about a fiver. It's a great bargain compared to what the cinema normally charges. "When the kids start to flag we go outside London overnight. I have several good friends who live less than an hour's drive away, so we stock up the car and make it an adventure. Most have kids the same age, or nearly the same age, so it's a lot of fun for everyone." When Dom has time off, the family loves to travel. For the past few years he has also taken the boys camping and caravanning, but now that the girls are older the whole family can go. "We camped one night in my sister's back garden and the twins loved it, so I think they're ready," says Tina. "My parents have an old caravan in Wales where we sometimes go, or we take our tent if we want to stay somewhere different. It's a cheap holiday but everyone loves it. And it gives us the chance to see family as well." Tina adds that she learned when the boys were a lot younger that you don't have to spend a lot of money to keep the kids happy over the summer. "We all look forward spending time together as a family, which is the most important thing. Doing lots of different activities stops them from getting bored, and keeping it cheap makes me happy as well. "It would be great to win the Lottery, but to be honest I don't know if our summers would change that much. Although maybe Dom and I would spend a week together in a five-star hotel in the south of France, instead of in the caravan..."